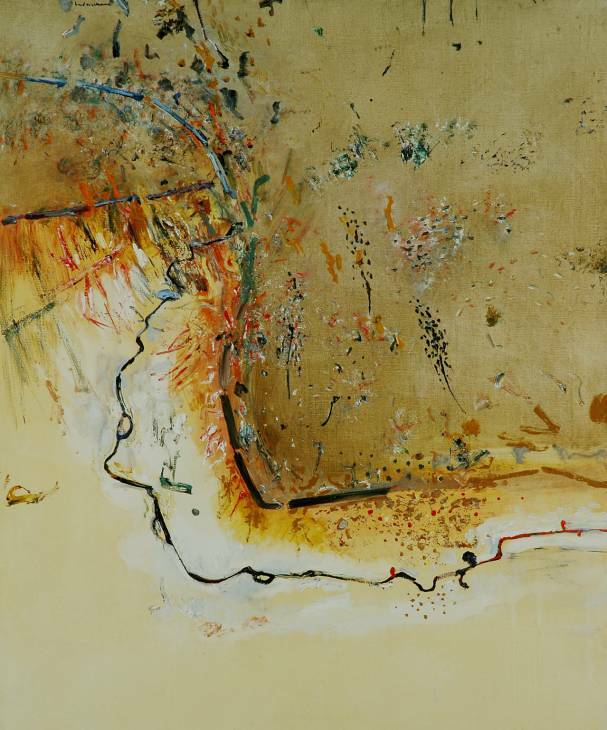 Fred Williams, during his whole life wanted to find a language that would express a new way to represent the Australian landscape, without any European influence; despite having lived in London for some time. It is in this city where he started to paint the same motif many times, a custom that he will follow for the rest of his days. From the series Werribee Gorge, Dry creek bed is acknowledged as the most well achieved version. Opposed to presenting his landscape according the classic figure-background, Williams chooses to paint the creek from an aerial view, making the motif bidimensional. Here, we see the earthly colors typical of the Australian landscapes and the dry creek clearly outlined in black. To complex the composition, Williams adds sparkles of red and details in green that represent bushes. Although the artist is cataloged only as a landscape painter, the interesting thing about his life is to notice that his search ended making his works to be in the border between the figurative and the abstract. ~ by Álvaro Mazzino on January 14, 2011. ……by Natalie Bennett.Theres both irony and inevitability that my introduction to a great Australian artist should have been not during my first 25-odd years in Australia but much later in London today at the Tate Modern. I read there that for the art world he emerged in the 50s and 60s but when I was at school in the 80s in Sydney the continuing cultural cringe ensured that Art meant long-dead white males the European masters..Williams had taken the inevitable path for the talented post-war Australian coming to London to art school and theres one of his early works on show in the Sign and Texture exhibition at the Tate Modern in which he is the dominant artist. The Samsung Galaxy S5 Neo will be backed by 2 GB of RAM. The smartphone will also come equipped with 16 GB of internal storage capacity and a microSD card slot for further expansion. This entry was posted on January 14, 2011 at 16:17 and is filed under Abstract.You can follow any responses to this entry through the RSS 2.0 feed.You can leave a response, or trackback from your own site.